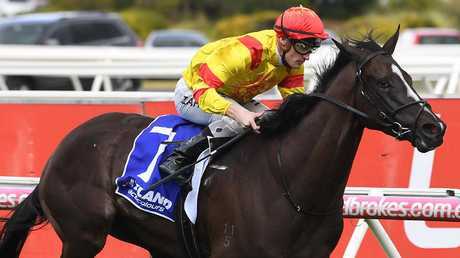 TRAINER David Hayes will go into the Australian Guineas in a commanding position of strength. His three runners are all last start feature race winners - $5 second favourite Amphitrite, $6 chance Hawkshot and $21 longshot Long Leaf. 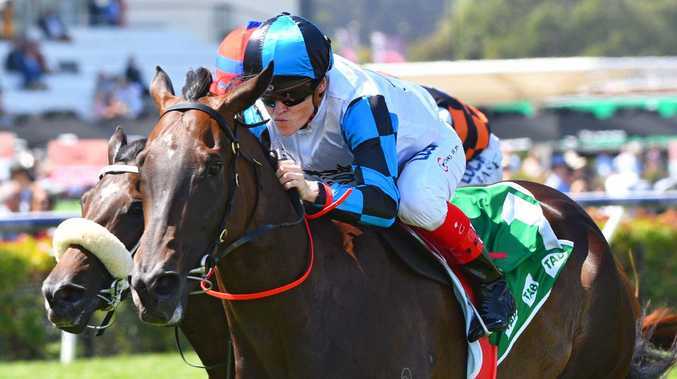 Hayes said Amphitrite, which won the won the Group 3 The Vanity over 1400m at Flemington in her first start for Lindsay Park, should be even better suited on Saturday than at her stable debut. "She's been really good since she's come over," Hayes said. "She loves Flemington and she's a better miler than a 1400m horse." Another ex-Weir trainer galloper Hawkshot debuted for the stable with a win in the Group 2 Autumn Stakes at Caulfield where he led throughout to win by 3.75 lengths. Hayes other representative Long Leaf won the Karaka Millions 3YO Classic at Ellerslie. Hayes already has Amphitrite in the All-Star Mile and he's hoping one of the other pair can get in to the race with a wildcard. Hayes said it was a dominant win by Hawkshot and he was also looking forward to him running over 1600m. "He defeated a good field and the third placegetter Ringerdingding ran well in the Orr Stakes last Saturday to underline the form," he said. 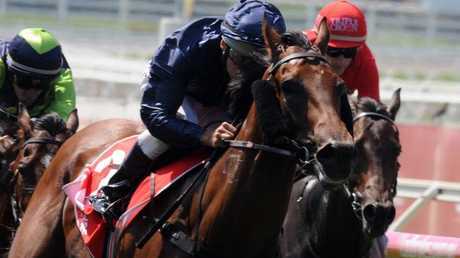 Hayes said Long Leaf had returned from New Zealand in good condition and believed the travel may have improved him. "It was a good field and he had to do it tough," he said. "He defeated two horses, Surely Sacred, who has since won the Avondale Guineas, and Imelda Mary, who won the Sir Tristram Classic." Hayes also confirmed he will give Redkirk Warrior his chance to become the first horse to win three consecutive Newmarket Handicaps on Saturday week. "I think he's flying," he said. "He got knocked down in the straight (last start) and if he got a run, he would have tested the first three. I'll put the blinkers back on." Hayes said he could have four runners in the Australian Cup - Sikandarabad, Harlem, Ventura Storm and Muntahaa. Tasmanian trainer Barry Campbell is confident Eastender can fly the flag for Tasmania in Wednesday's Launceston Cup as he attempts to complete the Apple Isle's feature Cups double. Campbell said Eastender's turn of foot to win the Hobart Cup at his last start was exceptional. "He's run his last 600 metres almost as quick as Mystic Journey and Hellova Street did in the Thomas Lyons and he did it at the end of 2400 metres and they were racing over 1400m. "It's absolutely amazing that a horse is capable of doing that, so if he has no bad luck on Wednesday and he just takes his Hobart Cup form into the race I expect him to be very hard to beat." 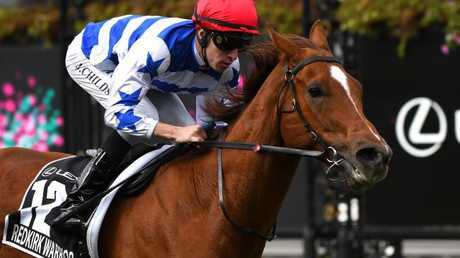 Redkirk Warrior and Santa Ana Lane have been given the distinction of being co-topweights in the Newmarket Handicap after both were allotted 58.5kg in the Group 1 sprint. Last year's Newmarket runner-up Brave Smash has 57kg, and then another ex-Weir horse Voodoo Lad has 56kg, alongside the James Cummings pair Osborne Bulls and Kementari. Grunt will return to racing in the Yulong Investment colours at Flemington on Saturday in the Shaftesbury Avenue Quality (1400m). Yulong Investments purchased 51 per cent of the son of O'Reilly with the idea to stand him as a stallion in Victoria when his racing career ends. They want him as their foundation stallion in Victoria. The Mick Price-trained four-year-old stallion will use that run as a lead in to the $5 million All-Star Mile on March 16.